Dallying In The Dirt, Issue #230--- A stuffed Patty Pan Squash is the hit of the weekend. Another week, another failed attempt to follow a schedule. Apparently I was committed to taking the grandsons to camp last Friday and then we went away for the weekend again. Here it is Wednesday and you are getting last week’s and next week’s “Dallying” together. Maybe you won’t notice that I’m actually skipping a week:-) Part of the weekend with friends was good food, actually it was a significant part of the weekend. My contribution came straight from the garden. A few Summer Squash particularly the beautifully shaped Patty Pan ones were the basis of the dish. 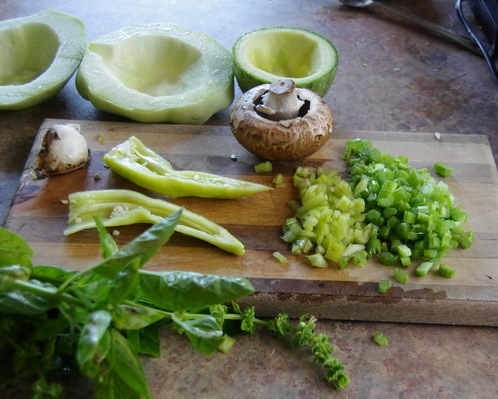 They are cut in half to make two flat round sections and then the softer inner part with the seeds is scooped out. The resulting hollow is then filled with chopped, Peppers (sweet and /or hot,) Garlic, Mushrooms, ( I had to buy them,) and some Basil and Oregano. Bake them or put them on the BBQ for 35 - 45 minutes until the flesh of the squash is tender. Even the people who winced when I carried in the basket of vegetables managed to enjoy them. While wandering with those friends, along some interesting paths on the weekend, they are all noticing the boats and the lake etc. and I’m always looking for interesting plants and pictures. 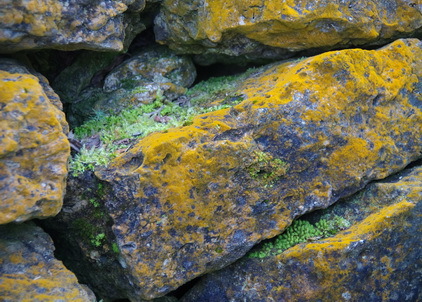 There was an old rock wall where the Lichens had developed into a brilliant orange growth on the sides of the rocks and on top were some tiny green succulents that I couldn’t identify. They made a wonderful picture if you took the time to look closely. I had to hurry to catch up with the group and I chose not to explain that I was taking pictures of rocks. They are very old friends and they are rather used to me doing some weird, plant related, things. In the days before we left, I noticed that all of my late season vegetables had started to germinate in the garden. Recalling what my friends, the bunnies had done to earlier plantings of Peas and things, I put the rabbit fence back up, around that section of the garden. Since I had left the supports in the ground it was a rather easy task. To date everything is growing nicely and the rabbits are busy eating something else. Soon I will have to climb in there and do a little thinning. It’s difficult to sow seeds like Cabbage at the spacing that the plants will actually need. Now that I can see what has germinated it’s time to create the correct spacing. Not everything that starts to grow in the garden is welcome. I have been watching the Tuberous Begonias and the Cucumbers waiting for fuzzy little white spots to appear on the leaves. 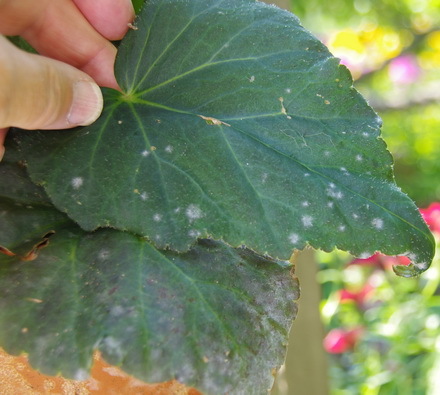 Powdery Mildew has made its unwelcome appearance. Some of the Zucchini and Melons are also showing signs of its inevitable arrival. It’s time to mix up the exotic, complicated spray. One part milk and nine parts water is all there is to it. The fat content of the milk does not matter, 1%, 2% whatever is in your fridge will work just fine. I know it sounds strange but it does work. Spray the leaves until they are wet and then repeat after a heavy rain or if you see the white fungus starting to spread again. This simple step will keep you in Cucumbers and Begonia flowers until the hard frosts of late autumn. Now it’s time to answer a few of my reader’s questions. Don’t forget to check the front page of the Website for frequent short ideas for current gardening activities. Mary Asks? Trumpet vine.... I'm finding eruptions of new shoots all over my yard and coming up under the deck. I diligently remove them trying to dig below the surface. If there is no foliage will the root eventually give up? I like to keep my shrubs neat and smallish, so I prune euonymous, Barberry regularly. Is there a cut off when I should stop? Nine bark and smoke tree just keep "producing"
Ken Answers! Trumpet vine is a delight for anyone who has a 15ft trellis and lots of room:-) As long as there is a portion of the vine growing happily somewhere, it will continue to send new shoots up from the soil around it. If the vine is removed then you will eventually kill the root by removing any new shoots that appear. Pruning the shrubs that are grown for their foliage, can be done anytime. Flowering shrubs should only be pruned immediately after flowering so that they may set flower buds for next year. Larke Asks?Some of the tulips I moved last fall didn't flower this year, or got buds that dried up rather than opening. I had something smiliar happen with my oriental lilies. I have read that bulbs don't like to be wet and we had some pretty wet weather last fall, followed by lots of snow last winter. Could the wetness be the reason they didn't flower? Ken Answers! Many bulbs such as Tulips, are native to parts of the world that are very dry during the summer and as a result they often don't do well in our irrigated gardens but if we don't supply water, then the flowers that follow them during the summer don't do well. A conundrum. Lots of snow would actually be beneficial to the Tulips. Moving Tulip bulbs will work but they often don't perform well the first year, have patience. Peter Asks? I have a flower called the evening primrose, a very delightful plant. It opens up in the evening an dies off the next morning! It is in a pot, can I leave it in the pot and get it bloom next year and will it seed itself for next year. Where would you put the pot over winter, in the cold room? Ken Answers! Evening Primrose, Oenothera spp. is a common perennial that is quite hardy. It has a habit of spreading quite quickly and each year I have to dig out a considerable amount so if yours does not overwinter, I'll happily give you a piece. It should overwinter in your pot if you keep it from freezing too solidly. Put it in the garage or cold room or bury it in the garden. Juliet Asks? I am very new to container gardening, after attending your seminar in Ajax this year. I followed your advice as closely as possible and the results are truly amazing......makes me think I am a gardener, ha ha. Well I planted 3 varieties of hot peppers, 'long' egg plant, (my favourite), kale, another favourite, and a few herbs. I am reaping beautiful fruit. My one tomato plant which I got free at the seminar is loaded with lovely roma tomatoes, another favourite. They are smaller than normal and I'm wondering if the container is too small, 10" across and 9" deep. I bought all my plants this year, but I would like to try starting them from seed next year. How and when do I harvest seeds from the peppers, egg plant, and tomato plants. Ken Answers! I'm delighted that you are having such success. Tomatoes are a bit difficult to grow in a container because of their extensive root systems. Compact varieties are available or use bigger containers. Collecting seed from your crops may not work well. Many of the vegetable varieties that you are growing are probably hybrids and any seeds you collect will probably not produce plants identical to the parents. I just buy new seeds each year, partly to try new varieties and partly because I'm too lazy to go to the trouble of collecting seeds. All of the plants, including the herbs, can be easily started from seed if you can provide enough light. Check out my web site, to find lots of information about starting from seed.